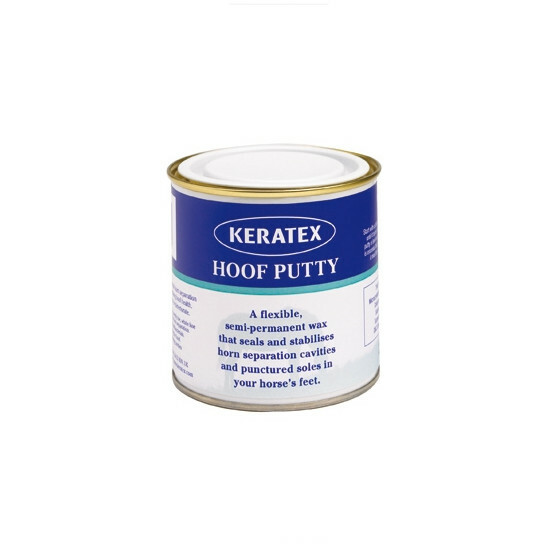 A pliable, versatile and flexible wax, Keratex Hoof Putty is specially formulated to fill holes in hoof soles, preventing further damage if dirt, stones or mud infiltrate the gap. Enhanced with anti-bacterial active ingredients, the putty forms a physical barrier to bacteria, preventing access to the sensitive hoof tissue where the immune system could be affected. Below are some recent questions we've received regarding Keratex Hoof Putty, including answers from our team. Hole at the top of the hoof. Hi, my horse has a hole in his hoof up by the coronet, where he had an operation. The site has now dried and hardened and he no longer has to have it dressed, but it is quite wide and shallow. At the moment the fields are dry, but as this will take a year to grow out, I wonder if this would be suitable and help? Yes this would definitely be worth trying. It is formulated to seal and stabilise the horse's feet and prevent damage from dirt, stones or mud. It has also been rated 5 stars by our customers. My pointer dog has two badly cracked nails, and I want something to keep out mud and small stones, keratex hoof putty sounds as if it will be perfect. Is it safe for dogs as he will probably lick his paws. Keratex is only intended for horses so it would not be advisable to apply it to your dog's nails. There are numerous paw balms and butters which can be applied to the site, as well as Biotin capsules which greatly improve nail condition and regrowth. Keratex has not been tested for this particular purpose and may be dangerous if ingested by your dog. If you are concerned or need advicee on which products to use it may be best to speak with your vet or a local groomer who can advise appropriately. Hi, I have a tb he has slow hoof growth n weak walls how can improve hes feet n promote growth he is having regular farrier attention . The most important thing is to provide a good food supplement to help provide optimum nutrition for the hooves. I would suggest Gold Lable Biotin Plus to be given every day for at least 6 months.This should help the hooves to grow more strongly in future. Applying a hoof oil will help a bit too. The hoof putty is for treating specific damage and is not likely to be of benefit to you.